"Hundreds of people with psychosocial disabilities are still shackled like cattle," said Shantha Rau Barriga, disability rights director at Human Rights Watch. "It's not only important for the chains to come off, the government needs to sensitize communities and invest in local mental health services. If not, people with psychosocial disabilities may again be subjected to the cruel and abhorrent practice of shackling and the government's ban will be an empty threat." 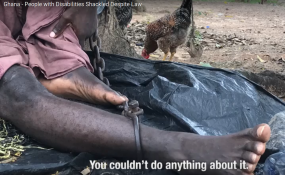 The head of Ghana's Mental Health Authority, Dr. Akwasi Osei, announced on World Mental Health Day in 2017 that the government would enforce the 2012 Mental Health Act provision that people with psychosocial disabilities "shall not be subjected to torture, cruelty, forced labour and any other inhuman treatment," including shackling. He said it was "illegal to put anyone in chains." A 63-year-old man who has been there since 2012 said, "When I go outside, I feel good. But we don't get to go outside." Osei expressed his concerns about the ongoing chaining and congestion at Mount Horeb: "You and I can be in their shoes. And the question is, if I am in their shoes... would I be happy to be treated that way? The answer is 'no.'" He went on to say that, "People [with] mental health conditions are human beings like us, and we should completely respect their human rights." Under pressure from the Mental Health Authority, the camp leadership has pledged to eliminate the practice of chaining. On a visit to the camp in September, Human Rights Watch spoke with Felix, an educated 46-year-old man who was among those freed in the camp. He was chained to a tree for five years, and continues to live there, free of chains, in a room of his own. He said, "When I was under the tree, it [was] very difficult there, very much difficult, and... we couldn't do anything about it." When asked what it felt like when the chains were removed, he simply said, "We were very much happy." "There is too much stigma and misunderstanding around mental health, leading to abuses against people with psychosocial disabilities, and no government body is watching," Barriga said. "Oversight is more important than ever to make sure that people who have been freed from chains have their rights and dignity restored."